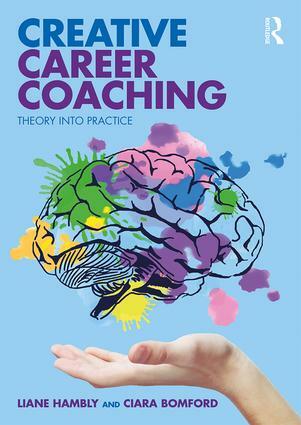 Creative Career Coaching: Theory into Practice is an innovative book for career development students and professionals aiming to creatively progress their coaching practice. Without losing sight of fundamental coaching values and practices, it encourages career development professionals to adapt their practice by harnessing imagination, intuition and critical reflection to engage clients. Hambly and Bomford consider the usefulness of creativity alongside traditional coaching models to reach "harder to help" groups. They consider a whole-brain approach to creativity, emphasising the need for coaches to adapt their client-facing skills for individual cases. They work through how clients make career decisions, how to use labour market information to motivate clients, how to frame a creative coaching session using techniques such as metaphor, visualisation and role play, how to use practical tools and techniques to resolve a client’s individual needs, and how to deliver on digital platforms. Combining the latest neuroscientific research with activities, summaries and case studies, this book provides a practical, skills-based approach to coaching. Creative Career Coaching: Theory into Practice is the first book to summarise the Creative Career Coaching Model. It will be an indispensable resource for students of career development, career coaching, coaching psychology and advice and guidance courses. It will also be of interest to career coaches in practice seeking to enhance their skills. ‘This is an ambitious text that strives, successfully, to emphasise the importance of theory to career practice by integrating broad theoretical understandings of relevant material derived from various academic disciplines (like neuropsychology and economics) with counselling skills (for example, micro, foundation skills, as well as goal setting and action planning) and models that are frameworks for practice (specifically, process models, guiding the interview structure, compared with content models, which provide detailed maps for exploration). All this is integrated with specialist knowledge for use selectively with clients, depending on their presenting needs (e.g. motivation, decision making skills, resilience). Having scanned the horizon regarding the impact of globalisation on the developed labour markets of the world, it significantly also picks up a major influence of globalisation, that is, the potential impact of digitalisation on practice. It tackles the pivotal importance of labour market information to efficacious practice, with all its subtleties. Nor does it shirk engagement with challenging issues relating to marginalised populations (e.g. Lesbian, Gay, Bisexual and Trans). Unusually and importantly for a text of this type, a chapter is included on the professional responsibility of the practitioner to take care of themselves, guarding against stress and trauma by engaging routinely with processes like their own continuing professional development, supervision, and similar. Liane Hambly is a Senior Lecturer in Career Development. She has worked internationally for the United Nations High Commissioner for Refugees and is also the trainer of choice for many public sector careers providers in the UK, having worked as a trainer and consultant with Careers Wales, Skills Development Scotland, Northern Ireland Careers Service, the Career Development Institute and many contract holders for the National Careers Service. She is responsible for developing the Creative Career Coaching model which is now widely used in the UK career development sector. Ciara Bomford manages people development for Careers Wales, the Welsh Government’s all-age careers service. She is responsible for the Level 6 Diploma in Career Development CPD for qualified advisers. She has twenty years of experience training and managing teams of careers professionals.